‘Advice to Hill Walkers’ is the second immense full-length album by Swedish based experimental psych aficionado ‘E Gone’ aka Daniel Westerlund. ‘E Gone’ melds together various musical stylings including electronica, psych, post rock, oriental, dub, raga, ambient and folk to create a stunning cacophony of mesmerising soundscapes. ‘Advice To Hill Walkers’ appeared briefly on cassette back in 2015 via the brilliant Zeon Lights label but its instrumental soundscapes sent ripples throughout the sonic ether, instantly captivating & permeating deeply into the psyche of the few listeners who had the pleasure of hearing it. Now the album gets a fitting rebirth and an expanded CD reissue on September 30th via the brilliant Virginia based ‘Sunrise Ocean Bender’ & ‘Deep Water Acres’ respectively. The albums opening track, ’Mark The Spot Where You Leave The Injured’ fizzes into existence on a giddying droning swirl and a captivating intricate chord progression. A sparse percussive whirl adds atmosphere as the track builds into a menacing droning monolith, weaving stunning hallucinogenic visions draped in swathes of beautifully golden resonating frequencies. The eastern flavoured ‘Your Goal Is To Know Everything And Say Nothing’ arrives and instantly tickles the senses as its hypnotic instrumentation snakes and whirls through the sonic ether with relative ease, all the while captivating this listener with its tempestuous musical peaks and troughs. Up next, ‘Follow Moonmilk Rivers’ explodes into ear shot on a wave of glorious instrumentation, filling the mind with wondrous throbbing bass frequencies, tribal percussive attacks, swirling sitar progressions and entrancing musical patterns that collectively hypnotise as they pulse a chittering cloud of reverberation out into the burgeoning sound sphere. ‘Follow Moonmilk Rivers’ is a beautifully constructed piece of music that completely mesmerises as it meanders through its pre-designated course with stunning aplomb. Menacing synth swells coupled with a hypnotic guitar line announces the arrival of ‘Build Your Camp Out Of Alpine Moss’. A thunderous drum pattern & a dark organ progression enters the fray as the atmosphere swirls and steadily builds, adding an air of film soundtrack experimentation to proceedings. This for me, is spaghetti western style experimental psychedelia, brilliantly thought out and expertly constructed for our modern age, presented to us to digest and try to make sense of. In lay-mans terms: This is music! Up next, ‘Dwell In Tents By Day, Hike At Random By Night’ offers up an off kilter guitar progression coupled with sequenced bleeps and a cacophony of cascading musical tones. There’s a subtle psych/dub/raga feel to this track that will have you hooked so fast that you will eventually totally succumb to its addictive swagger and find yourself swaying to its immensely hypnotic metronomic swing. The album swerves into a more polished dub/electronica feel as ‘Fast Before Stalker Season’ cranks up and shutters into existence on a bedrock of sequenced percussive hits and programmed synth lines before ‘You Don’t Know It Yet But We Are Losing You’ rustles up more esoteric flair and injects some brilliant eastern edged vibes into proceedings. The sampled pitter patter of falling rain and a rumbling of thunder graces the ears before ‘Find New Methods For Compass Use’ introduces a swirling ambient drone that completely cuts through the soundscape, gathering momentum as it builds in intensity, all the while helping to focus the mind and calm the senses. Menacing percussive swells and shaking tambourines usher in ‘Bring Ice Axe And Rope’ before dark & oppressive synth swells bubble up from the outer reaches, purposefully deployed to scare and enthral all at once. The track shuffles and dances, loops and arcs through layers of immense instrumentation that includes banjo, guitars, synths and sequenced progressions of varying degrees that build and swirl to stunning effect making ‘Bring Ice Axe And Rope’ my favourite track on this entire release. Swirling banjo progressions coupled with glorious sitar and hauntingly good synth lines brings the albums lead single, the brilliantly named ‘Record The Humming Of Melodious Caves’ into earshot before skittish ‘tabla’ hits and the rumbling ‘dugga’ bass drum noises swirl into action. This is another addictive piece of music guaranteed to have you swaying with its snaking & motorik percussive movements. The albums penultimate track entitled ‘Continue Ascent While Blindfolded’ reverberates on a jangling guitar strum before organ stabs, light clavichord progressions underscored with sampled whirls & bleeps reminiscent to that of a dastardly ‘horror film’ merry-go-round scarily crawls into play! My recommendation is to listen to this track via headphones to experience what I mean ….. thoroughly dark & enjoyable! The albums closing piece is a ten minute plus thrill ride through electronica, oriental, folk, ambient, tribal and eastern musical themes that swirl and pulse swathes of beautifully hypnotic frequencies into the sonic atmosphere. 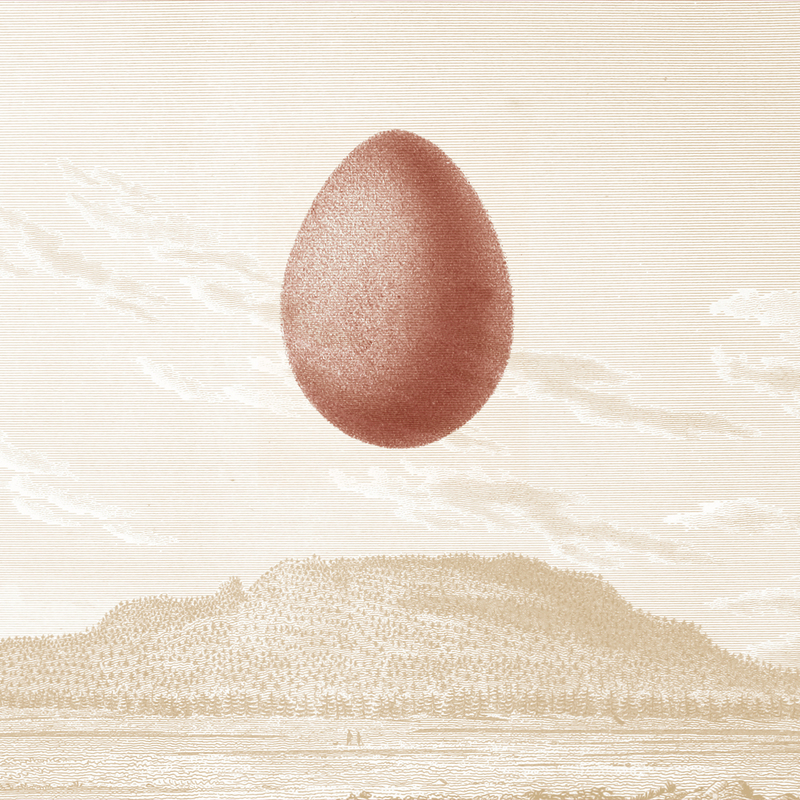 ‘Reach The Summit, Egg’ is a mesmerising finale to another wonderful collection of tracks created from the mind of Daniel Westerlund, a man who has mastered a plethora of musical stylings to produce something not only quite eclectic & different but immensely compelling too. Bravo!